Justyna Bargielska is one of the most distinctive and original young poets writing in Polish today. She has published eight poetry collections, won the Rainer Maria Rilke poetry competition, and twice won the Gdynia Literary Prize. Although her work has been translated into French, German, Slovene, Dutch, Russian and Czech, this is the first time that her poems have been collected in English. 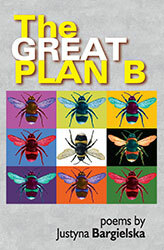 The Great Plan B introduces British readers to the work of a poet who examines, with forensic precision, the landscapes of quotidian existence, our disappointments and humiliations. Combining colloquial diction, philosophical enquiry and religious references, these poems are witty, tongue-in-cheek, both self-deprecating and macabre while death is increasingly present, implacable. You can never be entirely certain whether she is serious or joking. a priest, bare trees and a city buried in sand. z kuchni do pokoju po potłuczonym szkle. spuszcza szklane oko i podgląda te z dołu. tak jak by nie wiedzieli, że wcale nie trzeba. over broken glass from kitchen to bedroom. a glass eye on his fishing rod and peeps at the women below. with this life, as though they didn’t know you don’t need to at all. Tak szczerze, to myślę, że nie wiesz, czym jest tęsknota. pięćdziesiąt trzy razy pod rząd, że pies ci je kapelusz? Honestly? I don’t think you know what yearning is. fifty three times in a row that the dog’s eating your hat? jeśli liczyć od dołu, lub na ostatnim, jeśli z gory liczyć. gdy mowiłam o wiosennych cudach i o nowym życiu. There was only one and he died instantly. if you count from the bottom, or on the last if you count from the top. when I talked about Spring miracles and new life. to jest piękno, ktore chcę chronić. that’s beauty I want to protect. 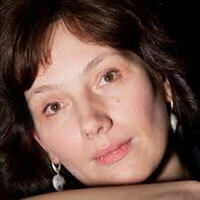 The translator, Maria Jastrzębska, was born in Warsaw, Poland and came to the UK as a child. She is a poet, editor and translator. Recent publications include At the Library of Memories, The Cedars of Walpole Park and a translation (with Ana Jelnikar) of Iztok Osojnik’s Elsewhere.